Blog » Where Did That Come From? Origins of Popular Wedding Traditions. Where Did That Come From? Origins of Popular Wedding Traditions. You have likely attended a wedding or two and have seen all of the traditions, but have you ever wondered where they came from? 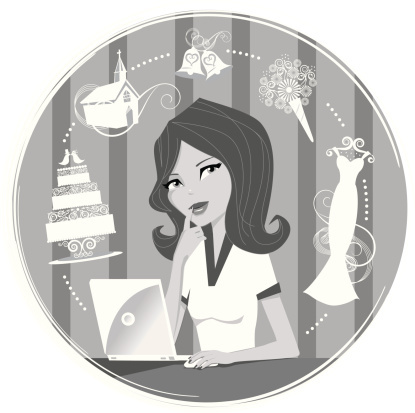 Why is the bride requiring something old, something new, something borrowed and something blue? Why does the groom toss the garter into a crowd of men, and why is a wedding cake so important? Nearly every aspect of a wedding has some sort of significance behind it, and we have been busy finding the origins behind some of the most popular wedding traditions to help give you a little perspective. You know what details are involved, but why do we do it? While fashions have changed throughout the years, bridal gowns often reflect traditions and customs of times past…It wasn’t until Queen Victoria of England wore a white gown on her wedding day in 1840 that the white wedding dress we know today became popular. The white dress. Likely the most timeless detail in a wedding. Arranged marriages are often cited when discussing the origin of the wedding veil. When daughters were considered a commodity to their family, a marriage was a way of sealing agreements between families and increasing assets. A Bride and Groom would likely meet for the first time on their wedding day, at the altar. The veil was used to obscure the bride’s features, only being lifted after the marriage ceremony was completed. This was to keep the groom from backing out from the deal if he didn’t like what he saw. Some historians say that Ancient Romans were the first to incorporate the veil into the wedding ceremony, believing the bride may attract evil spirits on her important day. The veil was used to cover the bride’s face in order to protect her from evil spirits who were jealous of her happiness and seeking to disrupt the union. In the modern day the veil has come to signify the bride’s virtue. Or it’s just a fabulous accessory. Your wedding day is likely the only time it will be socially acceptable to wear such a stunning accessory. Don’t let this opportunity pass you by! The custom of flower bouquets has its origin in ancient times. Women carried aromatic bunches of garlic, herbs and spices to ward off evil spirits. It was also believed to be preventive measure in contracting the plague. In modern days it is generally accepted that the bride chooses a flower arrangement that she likes or matches her wedding theme. The bouquet is another opportunity to show off your personal style! The tradition of bridesmaids have a similar past rooted in superstition. In the past, a bride’s attendants dressed similar to the bride to confuse and distract evil spirits trying to spoil the bride’s happiness. It’s an honor to be in the bridal party and a major bonus if the dress can be worn again. The Groom’s right-hand man and partner in crime are duties not to be taken lightly. Stands for faithfulness, loyalty and purity. There is something special about incorporating tradition, even if you do so in an inconspicuous way. The ring bearer’s pillow symbolizes the promises of the dreams you have while sleeping, coming true. A small child is typically asked to carry the pillow which symbolizes innocence, the future and new beginnings. Three cheers to all of the excitement in a wedding day, as seen through the eyes of a Ring Bearer! The wedding cake has been a component of weddings since medieval times. Originally cakes were made of wheat which was a symbol of fertility and prosperity. As a relic of once performed fertility rites, these ‘wedding cakes’ would have been thrown at the bride. The once simple wedding cake has evolved into a multi-tiered extravaganza. The color of the cake is typically white, symbolizing purity. The joint task of the Bride and Groom cutting the cake was meant to symbolize their first joint task in married life. The gesture of feeding cake to each other is a symbol of the commitment the bride and groom are making. The cutting of the cake is one of the most cherished memories of any wedding. Why the fourth finger on the left hand? The placement of the ring on the fourth finger of the left hand stems from Ancient Greece. It was believed that the “ring” finger contained a vein which leads straight to the heart. This vein was known as the ‘vena amoris’ or the vein of love. The wedding ring has graced the fingers of lovers across cultures, varying in design and ritual but remaining a fundamental symbol of a union. The top layer of the wedding cake was traditionally saved by the Bride and Groom to be used at their future child’s christening, as it was expected that the bride would be with child within the first year. Eating the top tier on your one year anniversary? Because Emily Post said so. Tossing rice at the end of the ceremony is meant to symbolize rain, which is said to be a sign of prosperity, fertility and good fortune. More recently, wedding meddlers have cautioned against throwing rice because it was rumored to harm unsuspecting birds who swoop down and eat it once the crowd has left. This has been proven false. While grain presents no imminent danger to birds, it is more common to see different items in the sendoff such as bubbles or sparklers. Being showered with love and well wishes after the ceremony is a fantastic lead-in to the reception! This tradition originated in England and France. Guests would try to obtain a piece of the bride’s dress for good luck, which often left the bride nervous and tense throughout the entire ceremony in anticipation of her dress being ripped to shreds by the eager mob of wedding guests. To pacify the crowd and ease the bride’s mind, the groom began tossing out a piece of the bride’s wedding attire to distract the guests as the newlyweds made a quick escape from the reception. The garter toss is one way to rally all of the gentlemen to the dance floor. Ringing of bells during and after a wedding stems from an Irish tradition that the sound of bells would ward off evil spirits and ensure a happy family life. Ringing of bells both small and large is viewed as a symbol of happiness and the celebration of the couple’s new life together. This custom of carrying a bride over the threshold of their new home came from Medieval Europe with the belief that the bride was vulnerable to evil spirits through her feet. To prevent evil spirits from entering the house which may be lingering at the threshold, the groom would carry her into their new home. These days, it’s just fun! Carrying a bride over the threshold was thought to protect her from evil spirits. Which of these traditions will you incorporate into your big day? Share with us on Twitter and Facebook!